Bidding is underway until April 28 at GreatCollections for this historic PCGS First Discovery 2019-W Lowell quarter graded PCGS MS66. Only two of those recently released 2019-W Lowell quarters have the distinctive Professional Coin Grading Service designation, PCGS First Discovery, and are the first 2019-W quarters certified by any third party grading service. 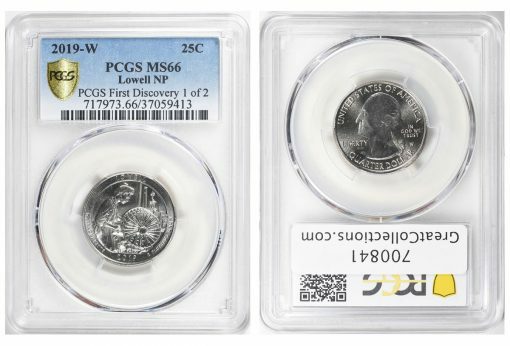 Graded PCGS MS 66, the coin owned by the lucky Virginia collector has now been consigned to a public auction to be conducted by GreatCollections® and can be viewed at www.GreatCollections.com/coin/700841. "It’s great to see the United States Mint thinking outside of the box to stimulate new collectors by introducing the first W mint mark on a circulating quarter-dollar," said GreatCollections President Ian Russell. "The first coins have already caused a frenzy, with thousands of people around the U.S. searching through quarter rolls looking for W mint marks. Personally, I haven’t found one yet, but there is still time and I am determined to find one in change!" Russell stated. The PCGS encapsulation insert indicates a pedigree of "PCGS First Discovery 1 of 2." "PCGS offered a $5,000 reward to whoever submitted the first America the Beautiful series 2019-W Lowell quarter for authentication and grading. The submitter would get their coin certified by PCGS and returned along with a $5,000 bounty. Two qualifying coins arrived at our offices at almost the same time; this one from Virginia and another, now graded PCGS MS65, from Kansas. The submitters agreed to split the reward," explained PCGS President Brett Charville. "Now the winning bidder in the GreatCollections auction will have the exciting opportunity to own one of the most historically significant coins of 21st century U.S. numismatics: an example of the very first circulating quarter-dollar with a West Point mint mark certified by any third-party grading service," Charville stated. "Excitement should only grow as special find pedigrees from the 2019-W quarter releases will have registry set bonuses for their respective sets in the PCGS Set Registry program," he added. GreatCollections (www.GreatCollections.com) of Irvine, California is an auction house for certified coins and paper money, as well as coins approved by CAC. Sales have exceeded $30 million over the past 12 months. For additional information, contact GreatCollections by phone at 949-679-4180 or by email at info@GreatCollections.com. If I had found this “FIRST DISCOVERY” coin I would keep it. Now if it was not a “FIRST DISCOVERY” and if I had another W Quarter I would sale. But the “First Discovery” is one of a kind, or 1 of 2. What would the rest of you do with this FIRST DISCOVERY? Yea it’s one of a kind, but I wonder what it would bring at auction. Less than 10k I’d keep it, more than 10k let it ride! I’d settle for an “Early Find” Lowell quarter. The current auction bid for this coin is currently about $3,500 & it still has 10 days to go before it sells. What do you all think it will bring when the auction is over?